Dasha Tassle & Teardrop Stone Earring Just $9.95! Ships FREE! You are here: Home / Great Deals / Dasha Tassle & Teardrop Stone Earring Just $9.95! Ships FREE! These earrings are very appealing in this color combo! Look like a small brown nut with a tiny green leaf attached! Order the Dasha Tassle & Teardrop Stone Earring Just $9.95! Ships FREE! Tassels are a trend we can get behind 100% and the Dasha earring is a perfect way to ease your way into this trend. 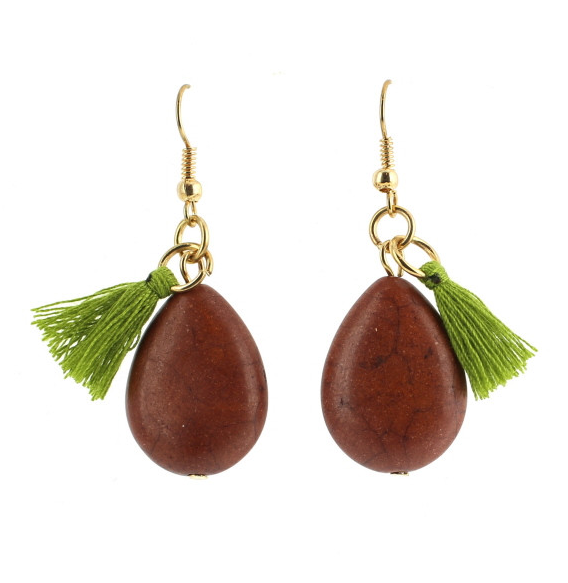 These fun teardrop stone dangle earrings feature the cutest of mini tassels in an accent color. Available in 3 color combinations! Stone teardrop dangle earring with a tassel accent.